Two internationally recognized medical researchers, a decorated military officer, a medical student with a passion for global health initiatives and a lawyer committed to raising money for neonatal hospital care are among the University of New Brunswick graduates who will be saluted this week. 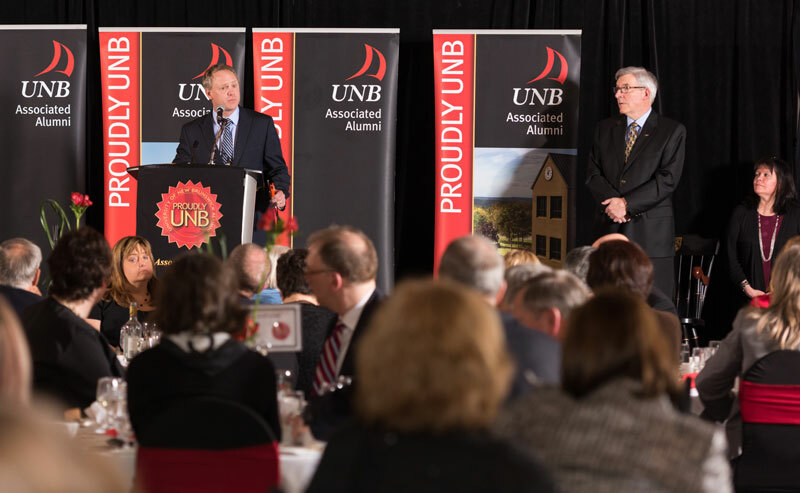 UNB will honour seven distinguished alumni and one group at a gala dinner in Fredericton this Thursday, April 21 at 6 p.m.
“The University of New Brunswick derives tremendous pride from the success of its alumni. The Proudly UNB Awards dinner is an opportunity to recognize and celebrate the accomplishments of some outstanding individuals and to share stories of our vibrant and passionate alumni community,” says Margaret Grant-McGivney, executive director of UNB Associated Alumni. Dr. Alan Cherrington (BSc '67) is a professor at Nashville’s Vanderbilt University in both the Department of Molecular Physiology and Biophysics, and in the Department of Medicine. He currently holds the Jacquelyn A. Turner and Dr. Dorothy J. Turner Chair in Diabetes Research and is a passionate researcher, mentor and educator. As president of the American Diabetes Association, he travelled extensively across the globe to educate people on the rapid spread of diabetes. Widely recognized in his field, Dr. Cherrington has not only made global impact in his field of study, but is also making an impact on his alma mater. Through the creation of the Cherrington Family Scholarship, he is inspiring young minds and giving future generations of UNB alumni the opportunity to study science and nursing. Dr. Blake Gilks (BSc ’81) is a world-leading researcher in gynecological cancers. A Fredericton native, his ties to UNB run deep, sharing UNB alumni status with his two brothers and his wife, whom he met while studying at UNB. In addition to being a professor in the Department of Pathology and Laboratory Medicine at the University of British Columbia, he is also a pathologist at Vancouver General Hospital, Interim Medical Director of Laboratories for the Vancouver Coastal Health region and President-Elect of the International Society of Gynecological Pathology. Dr. Gilk’s discoveries have shaped the understanding and treatment of a variety of cancers globally. In particular, his demonstration that ovarian cancer is actually five different diseases, with different causes, genetic risk factors, patterns of spread, response to treatment and patient outcomes, is reflected in the World Health Organization and has led to improved treatments in women with the disease. Kerry O’Reilly Wilks (LLB ’01) is the Head of Legal, North America & UK, at Vale’s Base Metals Business, one of the largest mining companies in the world. In her role at Vale, she oversees a wide range of legal issues in North America and the UK, including litigation, operations, strategic planning and health and safety. She has received recognition for her outstanding work, including being named one of Lexpert's Rising Stars – Top 40 under 40 lawyers in Canada in 2012. Last July, Ms. O’Reilly Wilks and her husband, Lloyd Wilks, spearheaded an extraordinary fundraising benefit in support of St. Michael’s hospital in Toronto. The benefit raised $250,000 for the neo-natal intensive care unit. Malachy’s Soiree will be an annual gala and auction inspired by the incredible care their premature son Malachy received while in hospital. Capt. Stephanie Smith (BN ’04) is a critical care nursing officer in the Canadian Armed Forces with a strong passion for healthcare and a wide range of professional accomplishments. In the short time since she graduated from UNB, she has had a significant impact on her field of work. Not long after graduating and joining the Forces, Capt. Smith was deployed on two missions to Afghanistan. During the second, she initiated a formal mentorship program for nurses and was awarded the U.S. Military Medal of Achievement for her exemplary work. She has also participated in two air evacuation missions and was deployed to the Philippines following the 2013 typhoon. In 2014, she received the Major General Barr Award of Excellence, which is awarded based on performance over an extended period of time, and a demonstrated high degree of excellence and professionalism. Kevin Ferguson (BBA '92, BA '93) is founder and CEO of a management consulting firm based in Fredericton, Mr. Ferguson represented UNB for 16 years on the Associated Alumni Council. Serving as council president during a particularly tumultuous time for post-secondary education in New Brunswick, he played a pivotal role in engaging alumni and advocating fervently for the future of UNB. Dr. Leah Levac (MPhil ’07, PhD ’11) has a growing concern with the lack of participation of marginalized youth in the development of policies affecting their lives. She is an assistant professor in Community Engaged Scholarship in the Department of Political Science at the University of Guelph, where she teaches, researches and explores her passion for the issue. She was awarded a Social Sciences and Humanities Research Council research grant focused on the impacts of northern urbanization and resource extraction on women and youth, and their role in public policy development and community decision-making. Though an Ontario native, Dr. Levac has a special fondness for the Fredericton region and her alma mater, where she received a Masters in Philosophy and was subsequently awarded a Trudeau Scholarship to pursue her PhD, one of only 15 students across Canada to receive this award each year. As a former Fredericton city councillor, she actively demonstrated her strong commitment and passion for public engagement and community development. Lyndsay Lovely (BSc ’06) is an occupational therapist and a third-year Dalhousie Medicine New Brunswick student with a passion for healthcare and volunteering her time to those in need. In 2008, Ms. Lovely was the recipient of the prestigious Soroptimist Foundation of Canada national award, whereby she was recognized for her work and future aspirations in women’s health. As an avid volunteer with a passion for global health initiatives, her most notable volunteer efforts have been her work in Haiti. In 2010, Ms. Lovely volunteered her rehabilitation services to those disabled by an earthquake in Haiti. She spent much of her time in the tent cities, established to aid more than one million victims who lost their homes. She has since visited Haiti twice more, working through a wide range of disasters. The Class of '59 Reunion Committee has truly set the gold standard for reunion committees. For many years, they have shown immense pride, enthusiasm and dedication to maintaining connections with their UNB classmates. With representation from every faculty, the team has made extraordinary efforts to reach every classmate and has created reunion experiences with broad appeal. Since celebrating their 20th reunion in 1979, they have organized a reunion every five years, and are already thinking ahead to their 60th in 2019. This group was also the driving force behind the creation of the UNB Research Showcase – what began as an opportunity for members of their class to learn about faculty research at UNB has now become part of the Homecoming program for all alumni to enjoy. Note to media: Some award recipients are available for interviews this week in advance of the event. To arrange interviews or for more information about Proudly UNB, please contact Jenna Kennedy.